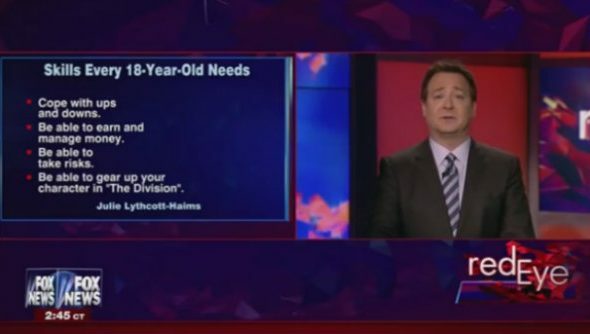 In a report on Fox News about some of the difficulties faced by today’s young adults, host Andy Levy went on a short rant about recent changes made to The Division’s crafting system. You could always just stop playing and wait to get something off our upcoming PC games list, you know. It happened on satirical Fox News showRed Eye with Tom Shillue, where a comedian comes on and pokes fun at topical events. In a segment about what basic skills every 18-year-old should have, being able to gear up your character in The Division popped up alongside other traits that modern youth should possess to make life a bit easier. For some reason ‘have rich parents’, ‘be born in the right place’ and ‘play games on PC’ didn’t feature. It seems like just a bit of lighthearted fun and is probably good for Ubisoft to get a mention on such a massive, mainstream show. I see it as good for gaming, too, with the host using terms that only a gamer would actually know, so it’s like we all got a shout-out, really. Anyone want a hug? While done in jest, this does follow The Division having a recent run of trouble with players taking advantage of exploits to get ahead.